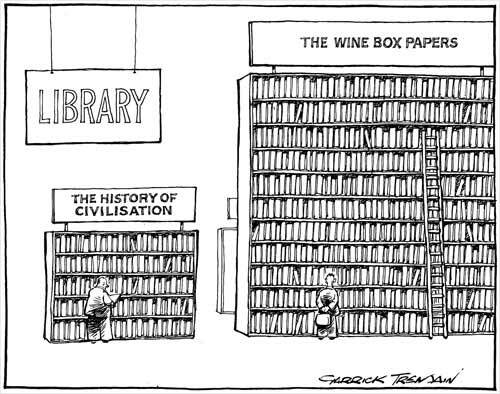 This cartoon comments humorously on the long-running and costly 'winebox inquiry', which was initiated and sustained during the 1990s by New Zealand First leader Winston Peters. The Commission of Inquiry into Certain Matters Relating to Taxation examined allegations of corruption in relation to taxation claims by New Zealand corporations and of incompetence by New Zealand financial regulatory institutions such as Inland Revenue and the Serious Fraud Office. Documents relating to the matter were brought into Parliament by Peters in a winebox, hence the commission's common name.